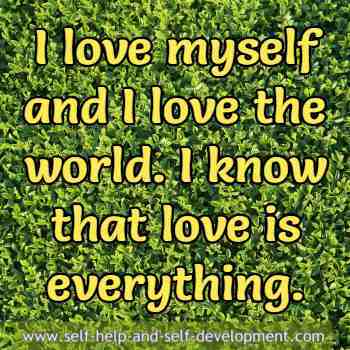 18 Self Love Affirmations To Love Myself. 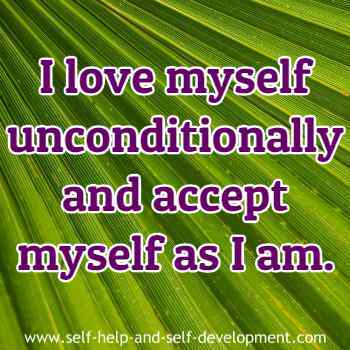 Self love affirmations will help you clear any issues that you may be having about loving yourself. Unless you love yourself, it is not possible to love the rest of the world. So read on. We all know the proverb ‘Charity begins at home’. Similarly, love starts with the self. It is just not possible to hate yourself and love everybody else. Remember, self love does not mean selfishness. Selfishness implies looking only after your own interests to the exclusion of everything else, whereas self love is a pre-requisite to love everyone else. Lack of self love has been linked to everything from failure in life to a host of imaginary and real diseases. When, for some reason, one does not love oneself or hates oneself, it translates into many problems. Subconsciously, this feeling sabotages any effort at success because success brings happiness and we don’t want to make someone we hate, happy. Lack of self love also breeds a sense of unworthiness. If we deem ourselves unworthy, then naturally we won’t do anything to please ourselves. This results in not taking care of oneself, dressing sloppily, losing enthusiasm and so on, thereby making oneself unpresentable. It is now recognized that most diseases of the body are psychosomatic, that is they result from the mind. When you hate yourself, the mind may stop caring for you and may express this uncaring attitude by manifesting some disease in the body. 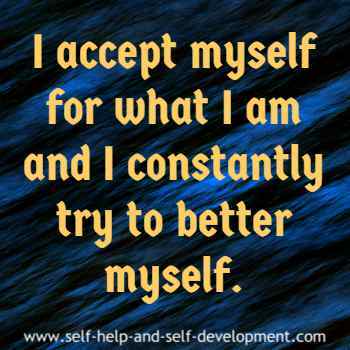 Self love affirmations will put a stop to this process. All in all, self love is central to worldly success as well as bodily well being. 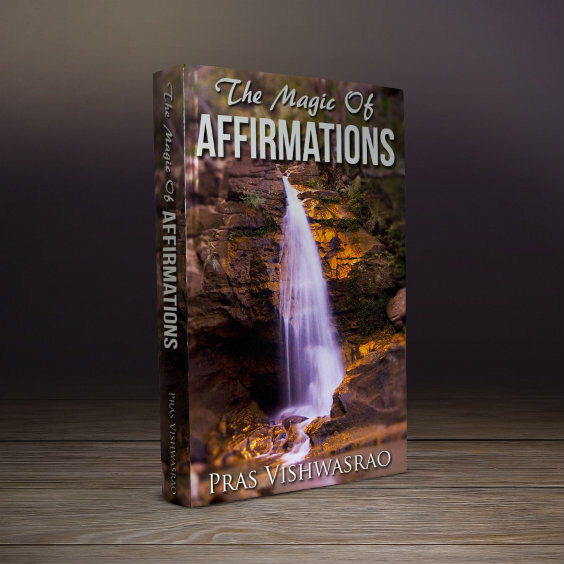 Even in Emotional Freedom Technique (EFT), the affirmation that is repeated is a self love affirmation. If you happen to go to a psychologist for resolving any problem, most of the times s/he will start by devising a strategy for you to start loving yourself. 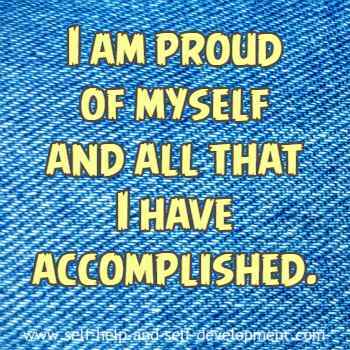 You will also find that all self esteem issues result from a lack of self love. 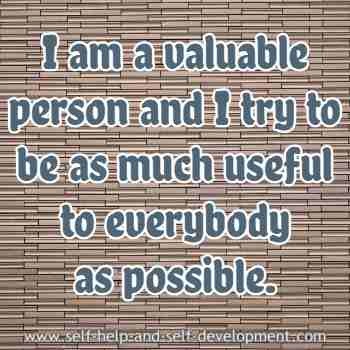 The following affirmations should be used by everybody, whether you have any issues to solve or not. Select one or two or more that suit you, repeat them with feeling a number of times during the day, if possible in front of a mirror. Over a period of time, you are bound to see positive changes in your behavior and your life. 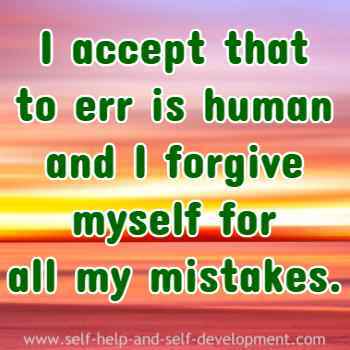 I forgive myself for all my mistakes. I recognize the divinity in me. and I constantly try to better myself. I try to be as much useful to everybody as possible. 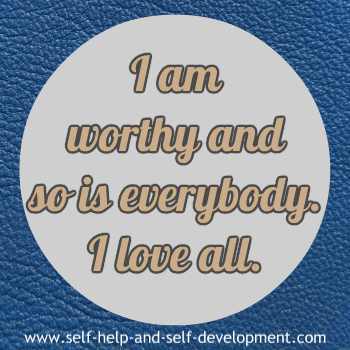 I am worthy and so is everybody. I love myself and I love the world. As a human being, I have both strengths and weaknesses. I concentrate on my strengths and ignore my weaknesses. I am own best friend. I am also a friend to the world. I forgive myself for not loving myself and I transcend all feelings of unworthiness. I love my body and take good care of it by all means. I successfully release the need for thoughts that cause harmful emotions like jealousy, hatred, etc. I let go of all reasons and excuses for not loving myself. I replace miserable thoughts by happy and loving thoughts. 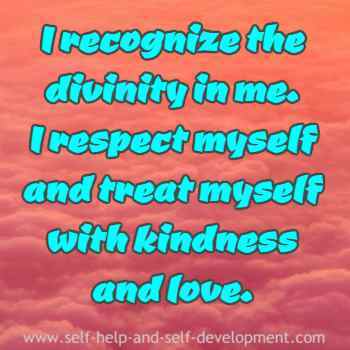 Self love comes naturally to me and I am richly rewarded for it. I accept self love as a way of life and I refuse to let people influence me in any other way. I practise self love without hurting anyone's feelings.